If it hadn't been leaked so damn much, the BlackBerry Pearl Flip 8220 would be something of a surprise. Not simply because it's the first-ever clamshell BlackBerry, but the fact that RIM went in this direction at all, especially when you look at the rest of its new phones, with their clean, almost aerodynamic lines, and compare them to this beefy slab of a phone. Landing on T-Mobile today, the big-boned Pearl Flip is aimed at people graduating to their first smartphone, and it definitely has its own kind of charm. Design I was a pretty, um, harsh critic of the Pearl Flip's design as photos of it leaked out. Turns out, it is the most design-challenged phone in RIM's new lineup, but for a different reason than I suspected. It's like each half of the phone comes from a wildly different gene pool. The top half is glossy black outside, and (fake) brushed metal—wonderfully modern and beautiful, if thick. The bottom half feels like it came from white trash branch of the family—cheaper-feeling, toy-like plastic (in black or red) that seems more appropriate on a carrier freebie. Totally incongruous, a bottom more like the top would've made it truly lustworthy. That said, it feels surprisingly nice in your hand, despite being something of a fatass. Compared to the old Pearl, it differs in two big ways on the navigation front: the trackball is recessed (so it can close) and the keys are almost completely flush (there's a barely noticeable, but palpable curve to them). The trackball groove actually works, cradling your thumb while you zoom around. The flush keys make it harder to cocksuredly touch type than if they were more pronounced, though the keyboard isn't unusable by any means. That really depends on how you feel about RIM's SureType keyboard generally. OS and UI Besides being a flip phone, the most significant update from a user standpoint over the original Pearl is that it's loaded with the latest, shiniest BlackBerry OS, with its incredibly polished Tron UI, as seen earlier on the BlackBerry Bold. Our past props (and jeers) for the re-designed OS and UI mostly stand. Graphically, it's a big step up from the previous OS, though we wish the text-based elements, like in email and the calendar, were bit more punched up as well. It translates fairly well to the Pearl Flip's smaller screen, visually speaking, but it's clear that the Pearl Flip lacks the horsepower of its more respectable brothers—it's appreciably more sluggish at times, and we ran into some retardiculous slowdown more than once. On the other hand, it has one of the best startup times we've seen on a BlackBerry (though the first 30-45 seconds of wakey wakey aren't quite usable). Still, on the whole, the new BlackBerry OS is imminently easy-to-use and almost as easy to look at. Screen and Multimedia The Pearl Flip's multimedia capabilities are nothing we haven't seen on the other new BlackBerrys. It uses the standard BlackBerry media player and organization (though dressed up in the new skin like on the Bold) that's definitely capable, but fairly generic, and not as enjoyable as using say, a Zune. Video is definitely watchable on the fairly sharp 320x240 screen—it's good for this kind of phone, but not mind-blowing like the ones on RIM's two flagships. Annoyingly for some reason, though, YouTube videos don't expand to fill the entire screen like a side-loaded one does, they stay in portrait. The Roxio-powered Media Manager still tests the nerves. And the 2MP camera and video recording are just okay—not abysmal, but not great. Browser and Other Software Yep, the browser does indeed work way better than pieces of crap RIM called browsers on the last gen of BlackBerrys. It actually renders HTML correctly! (Most of the time.) However, even on pages where the browser gets it right, you get a sad taste of its less-than-manly hardware as it struggles to keep up with you trying to navigate around the page once it's loaded. Even over Wi-Fi—there's no 3G to speak of—it can be godawful slow, especially on sites with a lot of scripts running around (Slate, for instance). The lag makes zooming in and out awkward more often than not. So, while a huge, huge improvement over the past browsing experience, it's held back by a lack of processing juice. Emaiil is what you've come to expect on a BlackBerry—excellent—and like the Bold, it's now in full HTML. 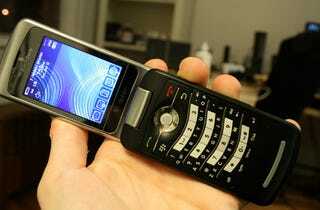 It comes loaded with MyFaves like any other T-Mobile phone, and all of the usual BlackBerry software—BrickBreaker, Maps (though no GPS, WTF), Office to Go, Voice Notes, etc.—as well as a healthy dose of IM clients, from AIM to Gtalk. Conclusion I'm torn on this phone. The most consumer-oriented phone of RIM's lineup, straightforwardly speaking it's also the weakest. So, while we don't know the pricing of the upcoming Curve replacement (likely $199 or $249), users looking to step up to their first real smartphone might want to wait to check it out before stampeding to the store for the Pearl Flip, since it's not cheap at $150 with a two-year contract. Also, QWERTY > SureType, even as good as RIM's predictive text is. But it's not a bad phone, at all—compared to the wealth of dumb feature phones out there, it's exceptional. It's a full-fledged BlackBerry that delivers great email, solid multimedia, usable web browsing and all of the other trappings of a smartphone, like apps. And it definitely has a quirky kind of personality to it. So, if you're looking for a smartphone in a tight form factor—or maybe for your teen—this might be what you're looking for, since the BlackBerry experience remains one of the best.